This year I began a new Christmas tradition that I hoped would help me slow down and live into each moment of this holiday season. This was JUST the thing! Raised a Methodist, I have seen season after season of Advent wreath lightings in church services around Christmas time. I never knew that the tradition could be used as a personal ritual in preparation for Christ’s birth! 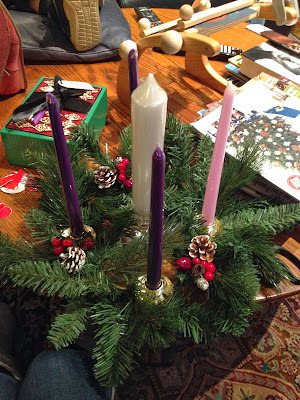 Most of my friends had never heard of an Advent wreath before I undertook this four-week spiritual journey. If you are like them, you’re in luck! I will gladly explain it to you. An advent wreath is a circle of candles in a wreath of evergreen, coming from German tradition. Each candle has a specific symbolism, and typical Methodist wreaths include three purple candles, one pink candle, and one central white “Christ” candle. As celebrated in the churches I have visited, one candle is lit for each of the four weeks leading up to Christmas, to symbolize our preparation for Christ’s coming. The Christ candle is lit on Christmas Eve or Christmas Day. 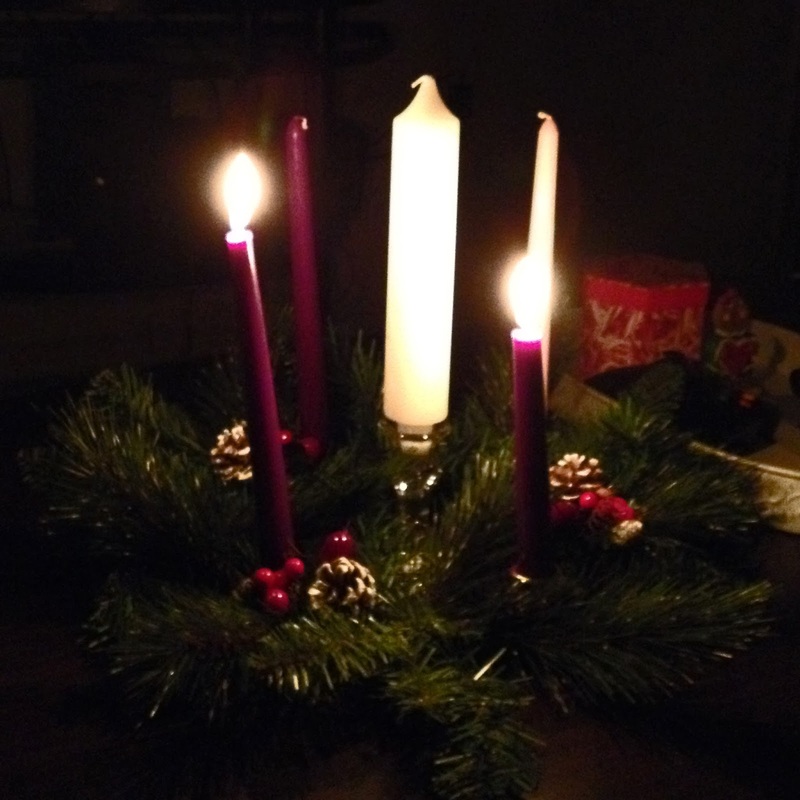 If you’d like to learn more about Advent as celebrated in the Methodist church, click here! I was first inspired by the adult leader of the meditation bible study I attend at the Denton Wesley Foundation to begin a mindfulness practice for the upcoming Christmas season. I wanted to spend the season being PRESENT, living each moment to the fullest and not waking up at the end feeling as though I missed the point of everything. We discussed various ritual practices that can help us live the holidays spiritually, and doing a daily advent wreath called to me. I rushed to the Hobby Lobby (I am their most loyal customer) and fought the busy crowds in the floral aisles to find a brass Advent wreath base (no idea they sold these!! ), greenery, little pinecone accents, and of course candles (which they also sold in an Advent set. Who knew??). After much bending and fluffing, I came up with a pretty acceptable-looking wreath. Side note: I used to think that wreath and garland making would be a nice hobby for me to add to my crafter’s portfolio… now I am just not so sure. First, because I have realized that each little element that goes on a wreath costs 3-4 dollars apiece! And second, I sadly don’t think I have an eye for plant decorating, fake or otherwise. Sigh. Oh well! My advent wreath is pretty enough and functional enough to serve its purpose beautifully. Anyway, after my little wreath was made, I composed a four week study plan in my journal with a theme for each week that I chose. My four candles represented Hope, Purity, Joy, and Expectation! I used plenty of the resources here to find applicable scriptures to read, prayers to pray, and little meditations to study. I also divided my usual Christmas traditions across the four weeks, according to theme. For the Hope week I planned to write and send my usual Christmas cards and put up Christmas lights inside and out– two activities that really send and speak hope in my eyes. For Purity, I decided to clean out closets and donate items, as well as evaluating the highlights of my life for the past year and my old New Year’s resolutions– out with the old! For Joy, I planned to sing carols with loved ones, watch Christmas movies, and bake goodies. For Expectation, I re-imagined the nativity scene and planned to create an art journal page celebrating the return of the sun (after Winter Solstice). This way, I did all of my usual traditional activities mindfully and spiritually. And each night, I sat in the dark with my journal, Bible, and my little Advent wreath, to light a candle or two and meditate on the coming of the light. Nearing the end of this holiday season, many friends have commented on “how fast it’s gone by” for them, but I happily don’t feel that way this year! The nightly study and mindful actions kept me grounded and slowed down the days for me. I consider it a rousing success! I can’t wait to see what new ways I will find to celebrate Christmas next year. I hope that all of you have had a beautiful Christmas season, and that you enter the new year with mindfulness and joy. A few of my favorite pages exploring being PRESENT and other mindfulness practices are below! Enjoy!